AN/PSQ-20/20A Goggles Blind? Good News! If your AN/PSQ-20, NSN 5855-01-534-6449, or AN/PSQ-20A, NSN 5855-01-603-0489, night vision goggles aren’t working, there’s good news. You can get them fixed if they qualify. The fix doesn’t cover ancillary items or components of end item for the goggles and is available only if the goggles fail after a thorough inspection following TM 11-5855-322-10 or TM 11-5855-335-10 or their -23&Ps. Your 94F repairman does that. New users will need to register by clicking on the HERE button on the left side of the web page. Returning users can log on with their email address, password and DODAAC. If you have questions, call Harris at (800) 533-5502 or (540) 563-0371. Many arms rooms already have a device that makes sure night vision devices, weapon sights, and driver’s viewers work properly. The TS-4348/UV provides a near- infrared uniformly illuminated target that shows if night vision goggles meet the high and low light resolution requirements called for in the TMs. Unfortunately, most TS-4348/UVs sit because no one knows how to use them. As a result, night vision or sight problems aren’t spotted until Soldiers go to the field. To learn how to use the TS-4348/UV, see TM 11-5855-299-12&P. If your unit doesn’t have a TS-4348/UV, order it with NSN 6625-01-323-9584 for around $1,700. Remember, to be accurate, the TS-4348/UV must be calibrated. Check its TMDE calibration label to see when it’s due. No label? Send it to TMDE for calibration. Because the following sensors and lasers will no longer be sold to the public due to a Class II laser exemption, their demil codes are being changed from F to D.
That means you can demil them without having to contact TACOM. Break the glass on all of them, including each of the lasers, and remove their batteries before turning them in to DLA Disposition Services. If you could keep from bruising your knuckles or breaking your back when you’re doing PMCS or equipment repairs, you’d jump at the chance. You’d probably want to know all about a tool that helps protect you while making you more proficient and efficient in doing your job. There is such a tool, but it might fool you at first. It’s a magazine and it’s small – but it’s one heck of a tool. Let’s think about that nut, tube, or other component that needs replacing. You’ve dug through a dog-eared tech manual, finally found the national stock number (NSN), and you’ve got it ordered. But the requisition comes back unfilled. That NSN is a terminal item and it’s out-of-stock. What the heck? How can you fix stuff when the Army no longer supplies the part? PS, The Preventive Maintenance Monthly, that handy little magazine, is the tool you need. The probability is that PS Magazine has already published a story about the NSN being terminal and has provided the new NSN you should be using instead. Or maybe some other Soldiers have noticed a part that gets overlooked in PMCS, but keeps other parts from working right when it fails. That puts your vehicle at risk of fire, damage, or loss. PS lets you know what to look for. Maybe there’s a new MWO out that you haven’t heard about yet. PS has probably written about it, telling readers where to find the MWO and who’s going to do it! Now, PS Magazine has been retooled just for you. In addition to the monthly printed magazine that’s been available to units since 1951, PS is now available as a mobile app for both Apple and Android tablets and phones. We’ve included static PDF issues from 2014 through February 2016, but the issues from March 2016 forward are interactive. Videos are attached to links in some articles, some articles link to photographs of equipment components, a link to our website allows access to our search engine covering all articles dating back to 2000. Additional videos are available on our Resources link for use as individual learning or team training material. The Hot Topics link allows PS to get late-breaking information to you concerning your equipment. Maybe a specific part needs to be checked immediately to avoid equipment breakdown, or there’s an urgent need for an unserviceable part so it can be repaired and put back into the supply system. 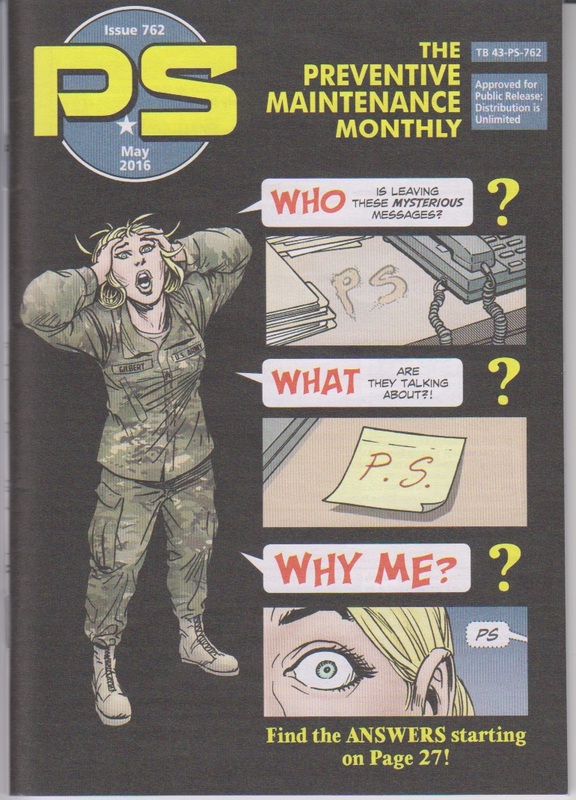 PS, The Preventive Maintenance Monthly is an official Army technical bulletin, but it uses color, sequential art (cartoon art) techniques, and equipment illustrations to provide you current information approved by equipment proponents. The May PS Magazine has Arrived! The Defense Logistics Agency’s (DLA) electronic documents service, eDocs, has migrated to a new operating system. This means if you need to get copies of scanned and signed DD Forms 1348-1A, Issue Release/Receipt, you’ll also need to request access to the new system. When your SAAR is approved, you will receive an email with instructions and helpful hints in accessing the new eDocs system. A popular Army equipment publication is back after a 7-year absence. TACOM LCMC started the Equipment Improvement Report and Maintenance Digest (EIR Digest) back in the 1970s. It ended publication in 2009 but is now back. EIR Digest covers all categories of equipment managed by the TACOM LCMC. It gives information on EIRs, equipment publication changes, 2028 response information, and publication actions. Issues are quarterly and the info expires two years after publication. To see a list of all available issues, type TB 43-0001-62-% in the Pub Number box and click Search. The newest issue should appear at the bottom of the list.